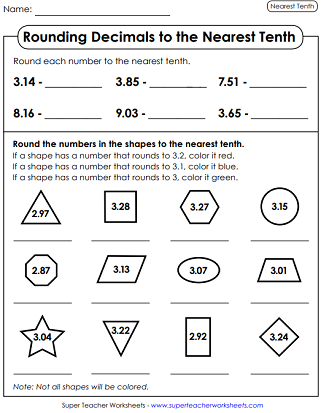 On these worksheets, students will round decimal numbers to the nearest tenth, hundredth,, thousandth, or nearest whole number. Most of the worksheets on this page are common core aligned. Practice rounding decimals to the nearest tenth. Round each number to the nearest tenth. Then color according to the instructions. Round each decimal number to the nearest tenth. This page has word problems and questions about rounding decimals to the nearest tenth and to the nearest hundredth. This file contains 30 task cards that can be used for small group activities, classroom scavenger hunts, Scoot! games, or learning centers. Part 1: Round to the nearest tenth. Part 2: Round to the nearest hundredth. Rounding Decimals and rounding money are two skills that go hand-in-hand. Jump to this page for rounding money worksheets. 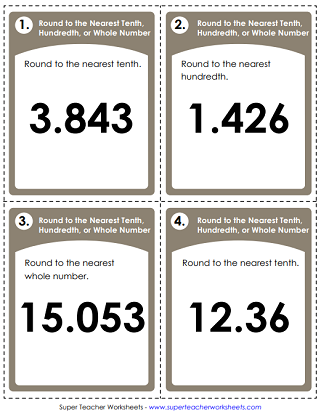 THis page has all different types and levels of rounding worksheets. 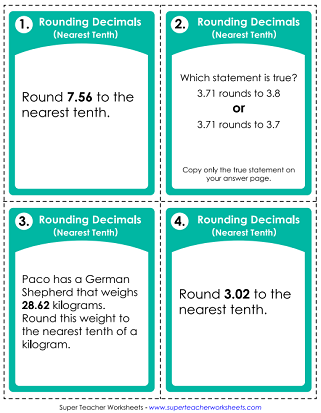 Whether you're teaching students to round to the nearest ten, hundred, or thousand, we've got a nice selection for you to choose from.